Thick-It® Clear Advantage™ - Same Great Products with a New Look and a New Name! "Looks like water, Tastes like water, Utilized like water"
Ready-to-drink: Thick-It® Clear Advantage™ Beverages require no measuring or mixing, and are ready-to-drink. Just chill, open, serve and enjoy! Available in 8 oz and 64 oz re-sealable bottles can be enjoyed in home and on the go, making travel a breeze. Clear: Thick-It® Clear Advantage™ Beverages clear appearance and natural taste may improve intake and hydration status while reducing medical complications. 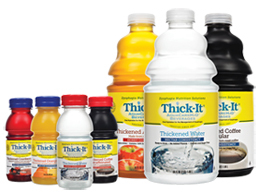 Consistent: Thick-It® Clear Advantage™ Beverages will not over-thicken over time and changes in temperature, ensuring you or your loved one receives the recommended consistency every time. Versatile: Unlike starch-based thickened beverages, Thick-It®Clear Advantage™ Beverages may be heated, chilled and frozen without changing the viscosity. Heat it: In a microwave safe mug, mix and heat with powdered tea, hot chocolate or coffee for an enjoyable hot beverage. Chill it: Mix and chill with powdered tea, lemonade, milk or a variety of other powdered mixes for a refreshing beverage. Thick-It® Clear Advantage™ Water can also be easily mixed with powdered nutritional supplements, like laxatives and protein powders. Freeze it: Freeze into ice cubes or popsicle trays for frozen treats.